An Ohio man and his 92-year-old grandmother want to help people with Alzheimer's and dementia this holiday season. Ross Smith and his comedy sidekick – his own grandmother, who goes by "Granny" — visited four different senior living facilities around Ohio last week and they brought with them a very special gift: puppies. Smith and Granny are a viral comedy duo who started producing funny videos together five years ago. The pair has become "best friends" since they started creating videos together, Smith said. "We're just trying to spread as much positivity as we can... it makes us happy, too," he told CBS News. This year, they decided to use their comedy talents — and puppies — to brighten the holiday for people living with Alzheimer's and dementia. According to the Alzheimer's Association, about 1 in 10 Americans over the age of 65 has the disease, and the risk increases with age. While Smith says his own grandmother is not affected by it, he thought it was the perfect cause for the duo to focus on. "It was time for me to to come up with an idea to use this voice we have and to give back," Smith said. "A lot of people were reaching out and saying they can't speak to their grandma and grandpa anymore because they have dementia, and they live vicariously through us." Smith said this inspired their visit to the senior living facilities. Smith told CBS News that people there responded very well to the puppies. "What I learned is people who are affected by Alzheimer's and dementia, they aren't receptive much," he said. "But with animals and music, they really have old memories come back and hit them hard." "So, when I go into these rooms and I speak to people ... you can tell they've been affected by this disease. But when you give them a puppy, it's like radio silence and they're so focused. It's like night and day." The puppies were lent to Smith and Granny by Petland, a local pet store in Lewis Center, Ohio. On the Monday before Thanksgiving, when the pair walked into the senior facilities with a bunch of puppies, the faces of the elderly patients immediately lit up. Smith produced a video of their visits and released it on Thanksgiving Day. He says he wants people with Alzheimer's and dementia to know they're not forgotten — especially at the holidays. "[People] just forget about folks when they're old," Smith said. "We want to give all we can to those who might not have families for the holidays or might not have a home or might have a hard time remembering the holidays." 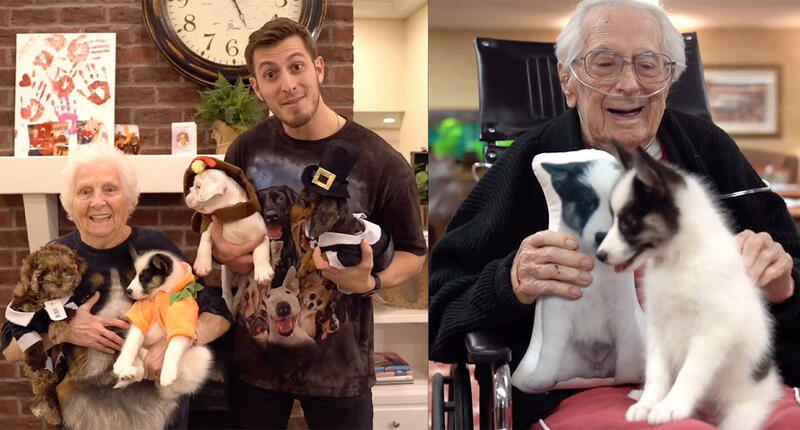 Smith's now-viral video shows the patients snuggling up with several different dog breeds. Some of patients were so comfortable with the puppies, they were lulled to sleep. Granny was also around to perk people up with a joke. "You folks are a perfect match," she told one woman holding a puppy. "Did you meet on Tinder?" she joked. Granny is constantly cracking jokes and pulling off pranks in her grandson's social media videos. In fact, she's become famous for them. Smith says he and Granny have over 19 million fans across YouTube, Instagram and Facebook. He and Granny first visited dementia patients back in June and decided to do it again this holiday season. This time, they left a lasting gift behind. "We partnered with a pillow manufacturer in Chicago and we said we're going to take an exact picture of each puppy and we're going to make a custom cut-out pillow," he said. "And we're going to go give these pillows to people when we leave so they have something to hold on to." This Thanksgiving we brought puppies to people affected with Alzheimers. We are so thankful to put smiles on so many beautiful faces. I challenge all of you to spread your love with someone in need this holiday season ❤️ Special thanks to Petland Lewis Center, The Village at Westerville, Otterbein Senior Life, The Inn at Olentangy Trail, Sage Park Alzheimer’s Special Care Center. And a huge thanks to @thecustompillow for donating the amazing pillows! For every pillow bought they donate one to someone in need! Smith said the puppy pillows were a hit, and his video shows that. Each person was handed a pillow that looked exactly like the dog they were just cuddling. He said the duo plans on doing this again throughout the holiday season and then continuing throughout the year. Smith said anyone who wants to help can purchase their own pillow from The Custom Pillow. The company teamed up with Smith so that for every pillow sold, a free one will be given to Smith and Granny's cause. "This all started just as a little, small idea to give back and use our platform. Inspire people to do good," Smith said. "We want people to be remembered and loved all year-round but especially during the holiday season, we want them to feel cared for."